Galaxy Note 8: What is Bixby Home and how can I activate it? 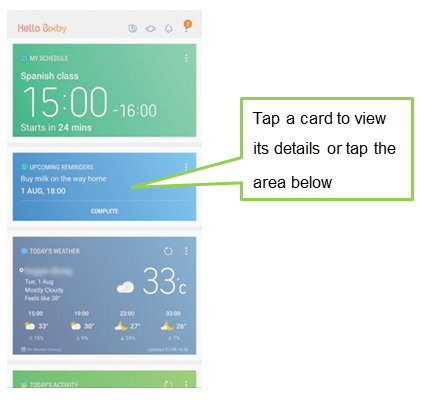 Bixby Home provides a page organized with various cards which are linked to native and 3rd party apps/services and it is enhanced by learning user's every day life and app/service usage pattern. 1 It provides fast and easy execution of app/feature/service by analysing user activity. 2 It displays activities from multiple social networks in a single card. 3 It provides 3rd party services that you have been interested in (such as news headlines, interesting keywords). 4 It enables you to complete the certain tasks in the card. ex. Calendar-Map, Call Uber, Nearby / Gallery app-Share, Convergence etc. Swipe to the right on the Home screen to launch Bixby Home.